In what could be the game of the season, the No. 1 Notre Dame Fighting Irish (6-0) will play host to the No. 2 Connecticut Huskies (5-0) on Sunday, (4 p.m., ESPN). The game will be featured in the Jimmy V Classic. The Huskies and the Irish have met annually since 1996 going back to their days as former Big East members. In the most recent poll, Notre Dame received all 31 first place votes. Both teams had to overcome deficits in Thanksgiving tournament games over the weekend. Notre Dame trailed No. 9 Oregon State by 14 at one point before prevailing for a 91-81 victory. The win over Oregon State was Notre Dame’s third win over teams in the Top 25 (No. 16 DePaul, No. 24 Drake) in the young season. Connecticut trailed in the fourth quarter against St. John’s before pulling away for a 65-55 victory. Both teams faced a Top 25 opponent in a mid-week clash before putting all preparations towards Sunday. The Fighting Irish crushed the No. 14 Iowa Hawkeyes by a score of 105-71 on Nov. 29, in South Bend, while the Huskies waltzed past the No. 16 DePaul Blue Demons on Nov. 28, 99-63. In 58 prior meetings between No. 1 and No. 2 in the women’s basketball polls, the No. 1 team holds a 36-21 advantage. Three of the last five matchups between No. 1 and No. 2 have featured the Irish and the Huskies, with UConn winning each matchup. The last time these two teams met occurred in the 2018 NCAA Final Four. 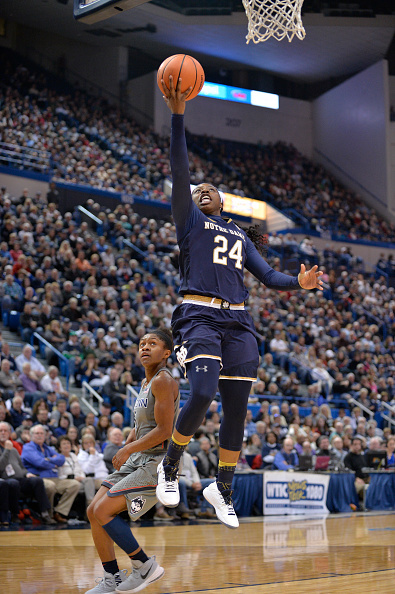 The two teams needed an extra period to finish business, but Notre Dame won 91-89 on a buzzer-beater from guard Arike Ogunbowale with one second left. Ogunbowale would hit a second buzzer-beater to lift the Irish in the National Championship game against Mississippi State. Ogunbowale returned to the Irish this season and partners with Jessica Shepard, Jackie Young, and Marina Mabrey to lead the top team in the country. The Irish also have back Brianna Turner, who missed last season with a devastating knee injury. Turner has been named to an All-American team for each of her first three seasons at Notre Dame and is looking to add a fourth. In the all-time series between UConn and Notre Dame, the Huskies lead 36-12. These two storied programs have met seven times in either the NCAA Final Four or the National Championship game, with Notre Dame holding a 4-3 advantage in those games.